WELLINGTON, New Zealand — The Christchurch-based Crusaders lost 31-22 to the Hurricanes on Saturday, forfeiting their unbeaten record in the final round of Super Rugby's regular season and likely surrendering the No. 1 seeding in playoffs which begin next weekend. The seven-time champions needed to beat the Wellington-based Hurricanes for the second time this season to hold out the challenge of the Johannesburg-based Lions for first place and the top seeding which guarantees home advantage throughout the playoffs. The Lions could claim that honor with a win over the Sharks in Durban later Saturday. The Crusaders appeared to have the match under control when they led 22-14 after 55 minutes. But lapses of discipline and defense allowed the Hurricanes to reclaim the lead with tries to winger Wes Goosen and flanker Vaea Fifita, then to seal the match with a late penalty to new All Black Jordie Barrett. The Hurricanes win lifted them into fifth place ahead of the Hamilton-based Chiefs who beat the ACT Brumbies 28-10 earlier on Saturday. That means the Hurricanes will face the Brumbies in Canberra in next weekend's quarterfinals while the Chiefs have the more difficult task of traveling to Cape Town to take on the Stormers. They beat the Stormers 60-21 in a quarterfinal in Cape Town last year. If the Lions beat the Sharks to take the top-seeding they will face the Sharks again in Johannesburg next weekend and the Crusaders will host the seventh-ranked Highlanders in Christchurch. If the Crusaders remain the No. 1 seeds, they will face the Sharks and the Lions will meet the Highlanders. The Crusaders appeared at times on Saturday to have the measure of the defending champion Hurricanes. Winger Seta Tamanivalu scored two tries in the first 15 minutes to give them a 12-0 lead and they were still ahead 12-7 at halftime. "We gave away too many penalties at key times and we had our chances but didn't convert them," Crusaders captain Matt Todd said. "You've got to take your chances in big matches like this and we didn't." Hurricanes captain T.J. Perenara said the Crusaders remain the team to beat in the playoffs but he was pleased his team "put ourselves in a position to play for another championship." Earlier, fullback Damian McKenzie scored a try among 18 points as the Chiefs beat a second-string ACT Brumbies lineup 28-10. The Chiefs held a narrow 13-10 lead at halftime but kept the Brumbies scoreless while adding two tries in the second half. "We were chasing the win and a bonus point on top of that would have been outstanding for us heading into next weekend but that's just the way it goes," Chiefs captain Aaron Cruden said. "Bonus points have eluded us this year." 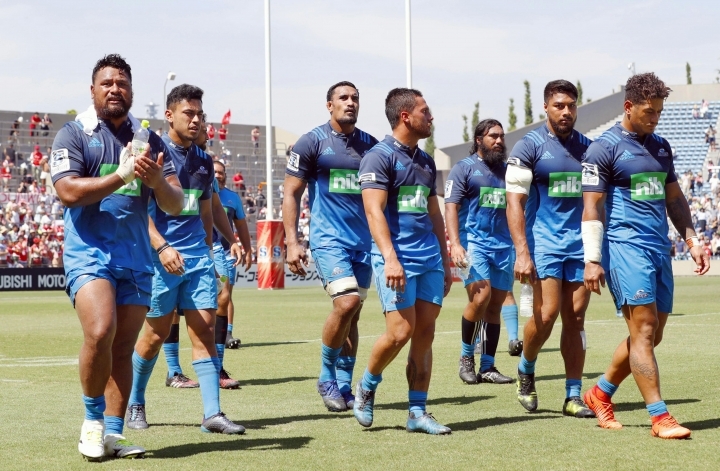 Japan's Sunwolves pulled off a remarkable turnaround by beating the Auckland-based Blues 48-21 only a week after a 52-15 loss to the Stormers and two weeks after their record 94-7 loss to the Lions. The Blues led 21-14 at halftime, mainly through an intercept try to fullback Michael Collins. 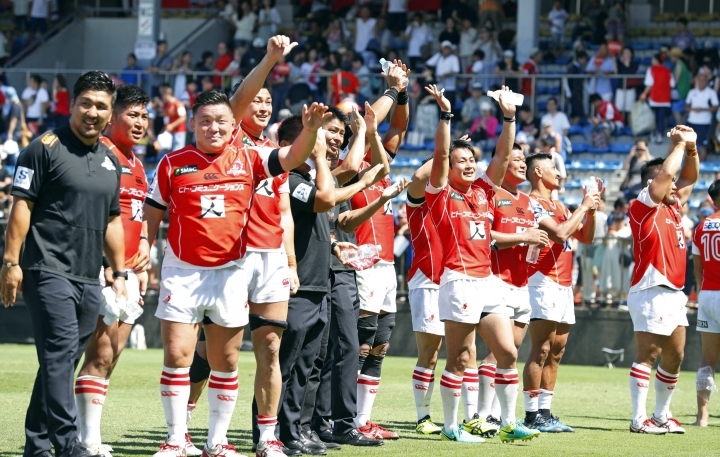 But the Sunwolves scored six second-half tries, including a hat-trick to center Timothy Lafaele, to post only their second win of the season, the third in their history and their first over a New Zealand team. The Blues visibly wilted in the second half as temperatures reached 42 Celsius (107 degrees Fahrenheit) in Tokyo. All Blacks flanker Jerome Kaino was sin-binned for a high tackle in the 57th minute and the Sunwolves scored two tries in his absence. Lafaele completed his hat-trick with tries in the 17th, 69th and 76th minutes. At Perth, Western Australia, the Western Force beat the New South Wales Waratahs 40-11. The Force are one of two Australian teams — the Melbourne Rebels being the other — reportedly being considered for elimination from the 2018 competition.